In the town of Herrington, Ohio something strange and menacing is about to occur, and it all starts at Herrington High. 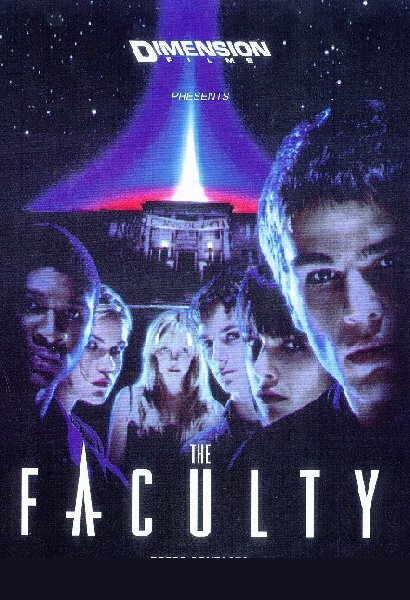 When the faculty of Herrington High begin acting very strange, and a new specimen is discovered, a group of students realize that their town is being invaded and being taken over by alien parasites. Now it’s up to these students from different cliques: Casey (Elijah Wood) “the geek”, Stokley (Clea DuVall) “the outcast”, Zeke (Josh Hartnett) “the rebel”, Stan (Shawn Hatosy) “the jock”, Delilah (Jordana Brewster) “the queen bee”, and Marybeth (Laura Harris) “the new girl” to discover who the queen alien is, and destroy her to save their once peaceful town. This Invasion of the Body Snatchers meets The Breakfast Club horror film is by far one of my all time favorite horror movies. The high school plays such a huge and important setting in the film, and we also get to see very familiar characters throughout it. By the end of the movie, we have seen the characters running for their lives throughout the many different areas of the school (hallways, the pool, locker room, the gym, etc.) The cast is great and they really nail the characters they are given and make them believable. Clea DuVall gave the best performance and had my favorite character as Stokley. She’s very smart, sarcastic, and doesn’t let anyone get her down. She’s also the one who helps come to the conclusion about what’s going on in Herrington. Among our young talented cast we get other big names like Robert Patrick, Selma Hayek, Christopher McDonald, Piper Laurie, and Usher. This is one ‘90s horror film that I feel is extremely underrated and doesn’t get the attention it deserves. It’s a fun and intense thrill ride with great and well-developed characters, chase scenes, mystery, and settings. Think of it as Scream with aliens. So if you loved Scream, there’s no reason you shouldn’t love or like this excellent horror/sci-fi flick.